The product launch improves the sensor nodes Waspmote and Plug & Sense! and the IoT gateway Meshlium making them faster, more accurate, energy-saving and compliant with the latest radio and cloud technologies in the market. This new generation adds more than 10.000 developers’ feedback. 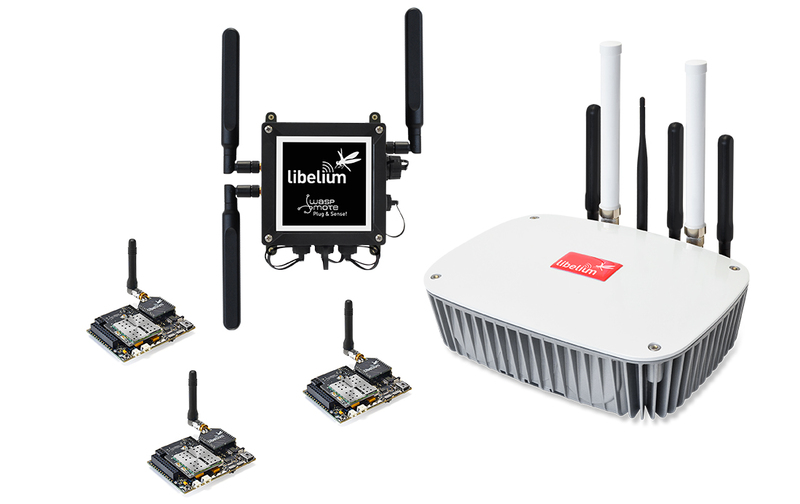 Libelium presents a new generation of Waspmote, the most complete Internet of Things platform in the market with worldwide certifications. This movement consolidates the company as a key player in the IoT after 10 years of business expertise. Libelium Waspmote and Plug & Sense! families increase monitoring capabilities to 120 sensors to cover hundreds of IoT applications such as Smart Water, Smart Environment, Smart Cities, Smart Agriculture, Smart Parking, etc. Some of the existing air and water sensors have been upgraded for better precision on particles measurement (ppm’s). The new version includes also actuators to control DC units such as irrigation valves, thermostats, illumination systems, motors, PLC’s, etc. Finally, new energy saving modes extend nodes lifetime from 5 to 10 years. In a very fragmented IoT market, interoperability is key to ensure Libelium technology will fit any project. The new version has updated and certified the following communication radios: LoRaWAN, Sigfox, WiFi, 4G, 802.15.4 / ZigBee, 868 / 900 RF. Also, the Plug & Sense! 4G US model is the first sensor device passing PTCRB and AT&T compliant device tests, opening the door for the big IoT cellular projects coming in the US market. Security is another key feature of the new generation. 5 different security layers integrates a system validated even for military use as it combines AES 256b encryption for data privacy in two different layers (network and point to point) and RSA 1024 for authentication and message integrity. Meshlium -Libelium IoT gateway- core migrates to a more powerful architecture and offers cloud connectivity off the shelf with 24 key players like Amazon, IBM, Microsoft, Telefonica and Thingworx. “Libelium has made a big effort getting the new products ready for the major IoT markets worldwide”, states David Gascón, Libelium’s CTO. Both Plug & Sense! and Meshlium are the first IoT platforms to be fully certified with CE (Europe), FCC (US), IC (Canada), ANATEL (Brazil), RCM (Australia), PTCRB (US) and AT&T (US). ”After 10 years, we keep our commitment to deliver continuous innovation for the IoT market making our products compliant with cutting edge technologies while increasing its robustness and reliability” he adds. Buy our IoT Kits at The IoT Marketplace!